The subtropical ridge is a large belt of high pressure around 30ºN in the Northern Hemisphere and 30ºS in the Southern Hemisphere. It is characterized by mostly calm winds. 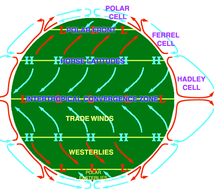 Air flows out from its center toward the upper and lower latitudes of each hemisphere, creating both the trade winds and the westerlies. This page was last changed on 14 June 2016, at 14:19.